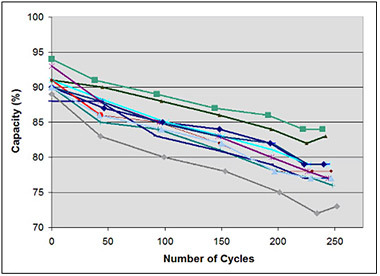 You get as many cycles only if you take care of the batteries. 1000 100% charge cycles with basically no loss of capacity suggests that shallow discharging isn't really useful. Ah but the first chart does not say anything about how charging was performed. The assumption is the batteries were placed in an analyser and charged/discharged repeatedly. The point of the chart was to rebut torne's assertion that charging per se is detrimental. The basis on which he made that statement still remains outstanding. Also why do the BU docs take the trouble to explain in the Li-ion sectoin HOW the charging should be done to preserve battery life. These later points are what i've highlighted, and are all linked in my first post. You want to comment on them ? My goal here is to establish the concept that not charging to 100% and partial charges are better than charging to 100% and letting the unit run flat. This is what a company whose bussines it is to test batteries has to say. Anyone who wants to counter that with sources of their own, go ahead. But general disagreement isn't really refuting what i've said , quite the contrary. The *chart* doesn't, but the article that contains it does indeed say that it's referring to full discharge/full recharge cycles. Also, the chart shows capacity dropping off with number of charges.. so it doesn't rebut my claim at all. I never disagreed with any of the things BU claim; I just noted that they don't make much measurable difference with batteries in regular consumer electronics, and that therefore it's probably a waste of time to implement a more complex charging scheme that gives people less runtime. I never said it wasn't, just that it's not very important. Please read more carefully. My ipodvideo's battery has not been replaced since the device was made in 2006, was used by someone else before me, and neither I nor the previous owner took any care over its battery whatsoever. When I got it halfway through its life, it lasted for 22-23 hours; it now lasts for 21-22 hours. If I only used it 70%-45% then even with a brand new battery I'd get way less runtime. The charge conditions are actually explained if you read the article. As for why your links seem to contradict each other, its probably because some of them are specific to individual battery models or testing procedures and cannot be generalized otherwise (e.g. they do not apply to mp3 players). If you figure it out, feel free to update this thread. Well, you've done the opposite. I guess if you find more data, you could try and make a better argument. Otherwise, it seems like this isn't worthwhile. You're right it says full discharge/recharge and we see capacity dropping with number of cycles. But you are also ignoring that it is the full discharges that are the result of lower capacity. The charging per se is not responsible for lower capacity. I've found nothing in the BU docs to substantiate that normal charging is detrimental to a li-ion batterys capacity. This chart was used with smartphone batteries, those batteries as close as you get to mp3 players, however their load is very different. So you could probably double the cycles for a PMP. The point here is again that full discharges negatively affect battery life as that is exactly how these batterys were discharged. Within the context of that graph the advice is offered against larger DoD and Charging level. The difference in cycles is almost fourfold with better management. How do you know that they don't make a difference ? The above graph leads me to think otherwise and the advice offered below the graph on the linked page supports it. Had i not read the BU docs i would not even realise that it matters not to charge to 100%. This is why i started searching the board and to my pleasant surprise found that somebody else had already earlier mentioned the same. I think the point you're missing is that if your suggested regimen is to charge to 70% and then only let it discharge down to 45%, you are throwing away a huge amount of your runtime *anyway*. Sure, but the idea is to foster a best practice. Articulating that best practice needs to be done. Does not have to be 70%, you can go upto 80% and bag an extra hour or more of runtime, 70% is less damaging than 80 which in turn is less damaging than 90 or 100. Throwing away is an exaggeration, i'm choosing not to use it, but the battery can still deliver it as opposed to being unable to. For me ~4 hrs/session is good enough. For those that need more time they need to get a player with a battery with more capacity than 15h to begin with. Its a sizing issue, ideally a player that can deliver 3-4 times what you need is better. It does not mean you do it all the time, there may be times when you need more run time. But if such a regimen is followed regularly the idea is you hold onto your player longer than otherwise. Its very difficult to know how long these batteries last because there are many variables involved, care, temperature, load, frequency of use etc. Just because you got so much time does not mean the same will apply to me or if you got much less time either. So the next question is what do i do so it lasts the longest. If this was a cell phone i would not be bothered at all as i could replace the battery myself. According to BU's docs, after a couple of years charging to 100% is worse than with brand new. A person that charged to 100% and used it with full DoD has got more run time out of the player, whereas i've deferred my use of it. But if they need more run time their battery isn't going to be up to it, mine will. How do you know the battery actually has this much life on it. Do you run battery benchmarks on it regularly ? The guage always goes to the top but the actual runtime can be a different story with the guage dropping faster than expected. There is another point here, your's is an anecdotal experience versus testing data by a battery company. I'm more inclinced to give the latter the benefit of the doubt. An ipod has got better battery life to start with than a clip+ which maxes out at 15 hours and i've got very attached to it & RB. The BU docs say its good to do a calibration every 40 partial charges, if you use it everyday thats once a month. I prefer to do it once very 3 months. Not too bothered if the guage goes out of sync by even 10% in that time so long as i know the battery is still going strong. FWIW i've found pulling the clip+ after a half hour gets me to about the right level. Then maybe you need to go read more about battery chemistry rather than just relying on a single source? It is a fundamental fact of every battery technology that we have that they degrade with use no matter what you do with them. There is no free lunch. Usage pattern can change the rate of degradation, but nothing is going to stop it. You keep repeating yourself explaining the same things that I'm not even contesting over and over, so that's getting kinda dull. This just doesn't make any logical sense. If 4 hours a session is good enough for you and the full capacity of the battery is 15 hours of runtime, then you don't have a problem! You can use the battery however is convenient, and it'll be many many years before it's lost enough capacity that it can't deliver 4 hours any more. You are receiving no benefit from some complex scheme. Someone who wants to use the player for 12+ hours at a time might benefit from the battery having a longer life, but *can't achieve that* by having the charging behaviour change, because if they don't charge it as fully, or discharge it as fully, they can't get their desired runtime even while it's new. The idea that you should have a battery that's 3-4 times the capacity you actually need is insane. Some devices happen to work out this way because their physical size/weight vs their power consumption allows for it, but most consumer electronics this is basically impossible: nobody makes a high end smartphone that lasts for most of a week on a single charge with regular usage, because you *can't do it* without making the device massive and heavy beyond what people will consider buying. And, again, if you *have* got a battery that's 3-4 times the capacity you actually need, then caring very much about the charging behaviour is a waste of your time because it will have way more capacity than you need for a *very* long time whatever you do: it takes an extremely large number of cycles to lose 75% of capacity no matter how deep those cycles. So, here's the next problem: our devices don't have "gauges". The batteries in almost all cheap consumer electronic devices do not have smart charging controllers built in, or even state-of-charge monitoring. The charge controller is part of the device, not the battery; it rarely stores any data whatsoever, and usually it's so dumb that you actually have to drive it in realtime in software to make it charge at all, which is why a lot of these devices can't charge without switching on. The percentage of battery displayed in Rockbox is not the reading from some gauge, it's just a guess based on the current cell voltage read by an ADC, compared to a hypothetical discharge curve that's hardcoded into Rockbox for that player. It completely ignores internal resistance because we haven't got a good way to model it. That same cell voltage is also used to decide how to charge the battery (which phase of charging to be in, etc). Smart batteries with real state of charge gauges are generally only found in laptops. So, yeah, all your comments about gauges and calibration and so on are completely irrelevant, because those things *do not exist* on any of the hardware we're talking about. Yes, I work on charging and power management code in Rockbox, so I battery bench my devices very frequently. As I mentioned above, since there are no battery gauges in these devices, this is a waste of time and is just using your battery more for no reason. The Rockbox percentage is a completely fixed calculation and the only way to get it back "in sync" is to battery-bench your device with its battery in its current state, work out approximately what the discharge curve is as a result, and modify the source code with your readings. Edit: Also, yaknow, I'm not stopping you (or anyone else) from implementing this and trying it, though obviously testing it objectively is going to be rather time-consuming and require comparing two devices. All I've tried to do is warn people that it may not be worth the effort. If you do implement it, test it, and can show that I'm wrong and the effect is significant, then that's great and I'll help you get your patch landed as soon as possible. You and another took no care, that means you charged to 100%, ran it till it was dead and recharged again to 100%, you've been doing this regularly for the last 6 years too. How is that possible ? i'd have thought you'd be getting half the stated life out of it by now if not less. ok, it looks like you got a 10% drop, over the last three years but thats nothing. Was looking at the specs of a lipo battery on allbattery.com, and the tests done on it, the vendor says 300 cycles full charge/discharge before the battery reaches 80% capacity. This is a vendor that is selling batteries, it concurs with the second graph posted above. That's in about four-ish years time. Whereas your ipod video hasn't gone below 80% in 6 years that too with no paritcular care. I will assume you use it regularly, say a few times a week, rather than per month. I'm sure you're aware of that lipo has no memory effect but this using it till its dead kinda makes me think of NiCads. You're doing the same with LiPo because you want the runtime. I'm aware of battery chemistry and that there is a fixed life in all batteries. So if i buy a clip, charge it and stick in the drawer and never use it. Let's assume i have some way of ensuring the lipo battery never gets below 2.2V . It's left there as is and never used. After some years the battery will lose capacity and eventually die. The point where i came in is you assert that regular partial charges are worse than letting the device run down. I can't find any evidence that charging is bad, only that DoD is. It would seem you are using your experience with the ipod video to make the statement that fewer charges, is better than more ? Actually you cannot make that statement rather what you are saying is that nothing bad happened and here is my ipod video to show for it. will reply to your other points later and thx for taking the time. Yup. It's not really a fair comparison because Rockbox really does consume significantly less power than the original firmware at this point, so if my battery was brand new I'm sure it'd get *much* more than 20 hours. Not ran it until it was dead, I charge it whenever it occurs to me to do so (i.e. whenever it's convenient). I don't need to use it for 20 hours at a time, generally, but I don't recharge it every time I use it either. And yes, I charge to 100% because I just leave it plugged in until it's done. As I said, the power consumption is lower, so the battery capacity probably has dropped quite a bit. I expect it has way less than 80% of its original capacity now, but I don't really know; I can't easily battery bench it in the Apple firmware, and I'm not motivated enough to do it the hard way, and I don't exactly know what Apple's stated life is based on, so without measurements from when the battery was newer it's hard to work anything out. I haven't used it much for the last year or so, but before that I used it regularly, yeah. I never said anything of the sort. I said that you are unlikely to see much practical benefit from minimising depth of discharge compared to just charging it when you feel like it. Discharging it deeper and charging it fuller is worse for the battery's long term future than doing it less, but the difference just isn't that big a deal, and the practical impact of having worse runtime in the short term seems to make it pointless. Why inconvenience yourself when it's probably going to last just fine for years anyway? Hmm i don't see any ipod video logs posted for the battery runtime plugin. It seems the runtime plugin is not available in RB for the ipod video. Damn, so it makes it harder now to tell how your battery deterioated over time. I found out the battery specs i quoted in my previous post were for a 0.2C discharge load that means the battery runs down in 5 hours. That's what the graphs are referring to above. 0.2C appears to be a standard battery test. So to interpret those graphs one must consider how long the unit takes to run down first. If its 10 hours thats a 0.1C load, if longer then even less, 15 hours is a 0.067C load. The only way i know to get anywhere close to a 0.2C load is to play FLACS in a loop on the clip+. Otherwise with mp3s it will be longer so the load is more like 0.1C or even lower. Am assuming a 0.1C or lower load will take longer (twice as long? )to kill the battery than a 0.2C load as its more gentle. This is a good point. I was fearing that the clip+ would be dead in about two years with normal use so was looking to see what could be done. There is a fixed time before a battery gives up the ghost. You can use that time either in small chunks or use more in a go. I guess this is your point, that either way you end up with nearly the same amount of work. So i guess the deep DoD isn't going to make a tangible difference. Shorter DoDs are better though its not so mandatory. So i guess an operating range from a charge level of 20 - 90% should be ok, not full DoD nor 100% charged, that's over 10 hours run time for a battery that can deliver 15h or 70% run time. The idea comes from sizing lead acid batteries for a home UPS. Sizing is cost effective in this case as those batteries do not like deep discharges and cycle time can be considerably reduced. A smartphone is two levels more complicated than a clip+. First there is the transmitter/receiver that needs to increase power as and when the signal weakens and ontop of that you might be doing some cpu intensive computing on it. A lot of unpredictable and heavy pulsed loads in concert. Not charging to 100% might help. People aren't going to give up their smartphones, better battery tech is required here. ok, so i still have the point about not charging to 100%. Here is another article in favour. A 100-mV to 300-mV drop in float voltage can increase cycle life from two to five times or more. Li-ion cobalt chemistries are more sensitive to a higher float voltage than other chemistries. That means choose whether to charge to 90% or as low as 70%. Interesting, did not realise there was so much control of charging in user land, thought the devices firmware would be responsible and the only option available to RB would be charge to 100% or nothing. This means you have to individually code a charging algorithm for each device RB is ported too, that is if you allow RB to do charging on that device in the first place. Incidentally what criteria do you use to decide the battery is full and to stop the charging ? That the 4.2V is reached along with timing ? If its hit and miss then not charging to 100% would be preferable. Thing is the battery benches tend to be close to what the user expects assuming the battery is in good working order, not read any comments that the RB 'gauge' is wildly off so far. Cadex caters to industry, not the consumer. I've got a MAHA for AA/AAA batteries and its been very helpful with knowing which batteries to use, pair with and maintain. Not going to 100% is the only point that really matters with a PMP and i don't think that's very complicated in comparison. Ah ok. So if i run battery benches every 3 months then that is what i have to do. Comparing with another device is not possible, though ideal. Can i prove to everybody here that this is a better strategy for longer battery life ? no, all i can do is point to the sources, reputable ones that say not charging to 100% is better. So i will do that for now. There is an IEEE paper from 2006 that talks about the same thing but i've not been able to get a copy. Getting it to the right amount so far turns out to be a matter of timing, its ~a half hour from 40-80% or a little more. Using a longer range needs to adjust accordingly. FYI, the Ipod Video is also called the "Ipod 5G". The only way i know to get anywhere close to a 0.2C load is to play FLACS in a loop on the clip+. Thats no different then an mp3 player. As saratoga pointed out we don't come anywhere near 0.2C load. FLAC is actually a pretty efficient codec, also; we have a number of codecs that need way more power than that. Yes, this is exactly my point. Your clip+ will, in all likelihood, still have perfectly good battery runtime after 5+ years of normal use. It probably will have a little more runtime after 5+ years of careful use with 20-90% charge cycles, but going out of your way to make sure you do this seems pointless to me because the benefit is really not that great. As I've pointed out *numerous* times now, I understand perfectly fine how charging to the highest possible state of charge is bad for the battery and I've not said a single thing that contradicts this. I'm just going to ignore you continuing to repeat the same points. Rockbox *is* the device's firmware (except on Android devices and the yp-r0, where it runs as a linux app). There is no "user land"; all of Rockbox runs in kernel mode and there is no other software running on the device once Rockbox boots. Some devices have a hardware charge controller that handles the entire logic of charging (like the ipodvideo, in fact, which has a LTC4066), but other than those devices, we *have* to drive it manually. Even when there is a hardware charge controller, we generally still have the ability to tell it to stop charging (the code for this is present but not used on ipodvideo) since it normally has an input for that, though it would have to be based on our ADC reading for the battery voltage since the controller doesn't usually tell you anything about state-of-charge. Yes, on devices where charging is not handled entirely in hardware we have to write the whole thing. People complain about the battery percentage being grossly inconsistent quite often, and it's usually because they have an old battery that's built up a high internal resistance. But, they are usually complaining about devices that are well over five years old; devices like the Clip weren't released long enough ago to have experienced significant battery degradation yet to the point where users will actually notice the percentage being a bad indicator. Sure it is, source two batteries from the same batch and install them in two identical players. I implied it was impractical, and it is, but it's quite possible. Everybody here who knows anything about batteries already knows this is a better strategy for longer battery life. I know it. That's not what I'm asking you to demonstrate. I'm asking you to demonstrate that the practical impact on a normal user using their mp3 player in a normal way, with or without this charging change behaviour in Rockbox, is actually something that the user will notice as an improvement. Page created in 0.095 seconds with 64 queries.